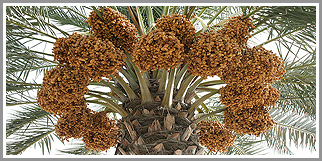 The main crop of Khairpur is Date. Date palms grow like weed in Khairpur soil. Date seeds discarded by humans and animals would germinate in due course of time in any unpaved ground. Varieties are numerous and cross-pollination ensures emergence of new once. The dry, hot climate makes the fruit very sweet, supple and juicy. Khairpur is also popularly known as 'The City of Dates', because of the numerous date palms that line its areas – and because of the various delicious varieties of dates available here.